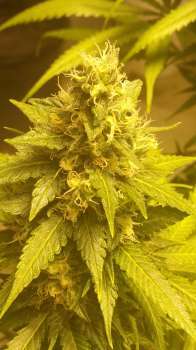 Here you can find a strain description about Crystal Blue Aurora and also some user-based reviews and infos directly from the SeedFinder (if available). You can also find the offers and auctions here if Crystal Blue Aurora cannabis seeds are on stock at MyCannapot right now. Crystal Blue Aurora (Pauls Crystal Aurora x Blue Tahoe) is a mostly indica hybrid (60% indica / 40% sativa) that is truly a joy to grow. This heavy yielding strain combines the bulkiness of Northern Lights and the frostiness of White Widow (Pauls Crystal Aurora) with the powerful blueberry aroma of Blue Tahoe, making it a strain that is not only plentiful but potent and delicious as well. This is an F1 hybrid so expect several phenotypes. She does very well indoors or outdoors, and with some training in early veg stage, she will produce many monstrous colas. Crystal Blue Aurora is great for pain relief, insomnia, gastrointestinal issues, AIDS, stress, and ADD. Also good for PTSD. Flowering time: 60-65 days. Buy Crystal Blue Aurora now at MyCannapot! There are no actual running auctions for Crystal Blue Aurora right now.